The Korea Herald has served as a leading English-language newspaper in South Korea for more than six decades. Its 65th anniversary this year, which falls on Wednesday, testifies to the paper’s unwavering commitment to provide accurate and reliable news to readers at home and abroad. 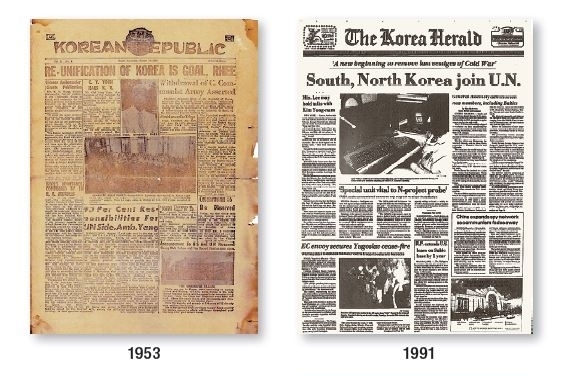 The beginning of The Korea Herald dates back to Aug. 15, 1953, just weeks after the end of the Korean War, when a four-page tabloid English-language daily, then titled The Korean Republic, was first published in a bid to allow the outside world to better understand the country. The Korea Herald had only three reporters at the time, including a managing editor and one photographer. The typesetting was done with a single Linotype machine, the most advanced technology by the standards of the era. However, the printing was done by Seoul Shinmun as The Korea Herald did not have a printing press of its own. In 1961, the paper switched its format to broadsheet, and it was in 1965 that the paper adopted a new name, The Korea Herald. In 1975, The Korea Herald implemented the computerized typesetting system for the first time in Korea’s newspaper history. At the same time, the paper expanded its number of pages from four to eight pages as its readership increased. The paper expanded into 12 pages in 1986. Currently, The Korea Herald publishes 20 pages on weekdays and 24 pages on Fridays including the Weekender section. In November 2007, Jungwook Hong took office as the new chairman of Herald, thereby introducing a set of reforms and changes that expanded the company’s business areas and boosted its stature. Not only the paper’s format and management, but also its headquarters went through dramatic changes. The first temporary office was located in a ramshackle two-story building in Mugyo-dong, Seoul, near where Lotte Hotel stands today. In November 1953, the company moved to a four-story building on Taepyongro and stayed there until 1978, when the paper and its sister paper the Herald Business -- then the Naeway Economic Daily -- moved to a modern building in Heohyon-dong. In July 2005, The Korea Herald relocated from Heohyon-dong to Jung-dong near Gwanghwamun in the heart of the Seoul. In 2014, the company moved to its current Herald Square building located in the tranquil town of Huam-dong in Seoul. The design of the paper has also changed over the past decades. The latest version adopts a business news briefing section and a page preview banner on its front page, along with a colorful graphic design on the second page. The first page of every week’s Weekender section features visually attractive designs. Besides the newspaper, The Korea Herald has been taking steps to adapt to rapid changes in the media industry by pushing the envelope on the digital and mobile fronts. For instance, in June 2016, the paper launched an in-house media startup named The Investor to provide real-time business news in English with professional insights. The Investor also delivers a premium newsletter called Decoded X, providing a glimpse into the fast-paced changes in business, financial and technology sectors. 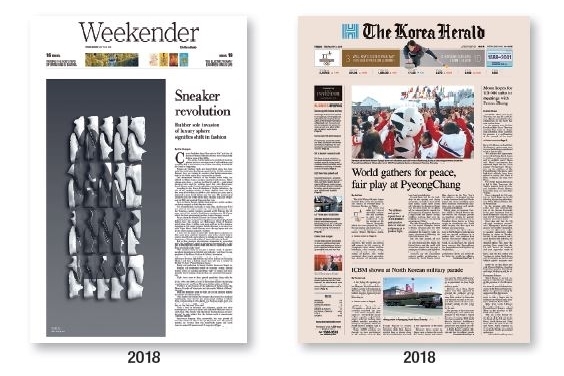 As part of a broader digital push, in August last year, The Korea Herald drastically revamped its website, both PC and mobile editions, in a bid to present carefully curated stories more efficiently in a format that is friendly for today’s readers on different digital platforms, from desktop PCs to tablet computers to smartphones. The Korea Herald is also extending its news distribution channels to social networks, such as Facebook, Twitter and Instagram. To meet the demands of both local and foreign readers who enjoy K-pop, the paper launched its official channel on the Naver V Live app and website last month, and started providing English news articles that cater to K-pop fans across the globe. The 65th anniversary comes not long after the paper issued its landmark 20,000th edition on May 4 this year. Leading political and business leaders including President Moon Jae-in sent congratulatory messages to celebrate the paper’s significant achievement in Korea’s English-language media industry.